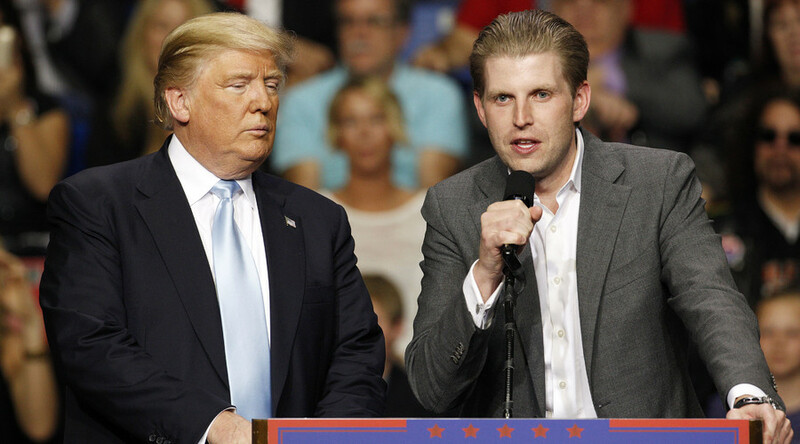 Eric Trump, son of the Republican presidential front-runner, received a threatening letter containing a “granular” substance, and now a multi-agency investigation is underway, led by the FBI's Joint Terrorism Task Force in New York and the Secret Service. While a preliminary field test found the suspicious white material to be harmless, how it was allowed to be sent to Eric Trump’s luxury Trump Parc East apartment just south of Central Park in New York City is part of the investigation, the Trump Organization told ABC News. The Postal Inspector and New York Police Department are assisting the FBI and Secret Service in their probe of the Thursday delivery. Lara Trump, Eric’s wife, was the one who reportedly opened the letter, postmarked from Boston, Massachusetts and dated March 5. A handwritten note inside read, "If your father does not drop out of the race, the next envelope won't be a fake," and was signed "X," according to the ABC News source. Eric Trump, 32, is one of Donald Trump’s five children. Two days before, Eric Trump went on Fox News and talked about security concerns at his father’s presidential campaign stops. Earlier in the week, a protester attempted to rush the stage, presumably to seize Donald Trump’s podium and microphone, prompting Secret Service agents to surround the candidate and whisk away the intruder. "That's the nature of politics,” Eric Trump said. “You're at these events where you have 30,000 people in a room, you might have one crazy person. I mean, that's just the nature of statistics, that's the nature of the game." At this early stage in the 2016 election process, the Secret Service only serves Donald Trump, not his family members. The NYPD subsequently also searched Trump Tower on Fifth Avenue and other Trump buildings, ABC News reported.